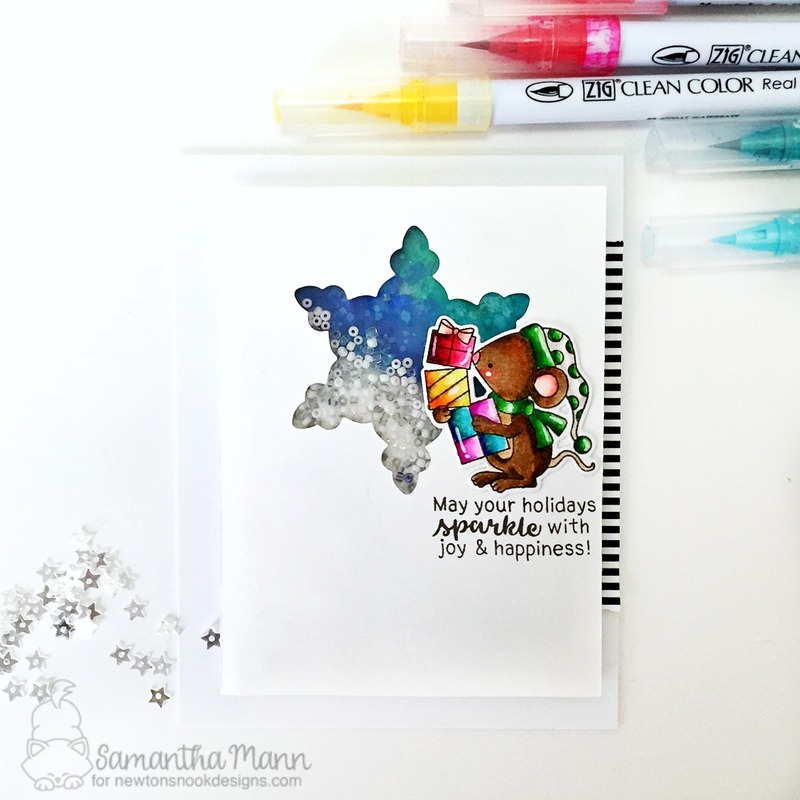 Sam's Scrap Candy: Deck the Halls with Inky Paws 2017 Blog Hop! Deck the Halls with Inky Paws 2017 Blog Hop! i'm so excited for the *FIFTH* annual Deck the Halls with Inky Paws Blog Hop! be sure to hop around to all the stops for the BEST chances to win! there are some AMAZING special guests, and it's going to be FUN! I created a sweet, little shaker card for my project today! I started by coloring my image from Naughty or Mice with Zig Clean Color Real Brush Markers and then die cutting out with the coordinating dies! to create the window for the shaker, I die cut out the snowflake shape with the Beautiful Blizzard Coordinating Dies! it created the perfect shape! I filled the shaker with clear and white seed beads and Picket Fence Distress Glitter! We will be choosing two lucky winners to win a $20 store credit for Newton's Nook Designs online shop! To enter, just leave comments on the Design Team Member and Special Guest blogs (see list below)! Two winners will be chosen at random from the collective blogs in the blog hop. Make sure to check out each of their blogs and comment for your chance to win. You will not know which blog has been chosen so the more you comment on the better your chances are of winning!You have until Sunday, December 10th at 9 pm EST to comment -- winners will be announced on the NND blog on Monday, December 11th. Gorgeous, stunning card as always!!! Wonderful color choice and amazing creativity for the shaker part!!! Love love love!!!! Eeek! That mousey is so cute! I love the fun shaker behind him too! Thank you so much for being part of our Deck the Halls with Inky Paws blog hop!! It's a shaker! It looks so amazing and festive for the holidays! Beautiful! Beautiful card :) love the design, superb! Pretty shaker card! Love that sweet mouse! Happy Holidays for sure with this creative card! Thank you! Love the shaker card.. all the bright colors on the packages really makes the card pop.. Love the contents of the shaker too! Perfectly done with the magic of the season. Gotta love a great shaker. Nicely done. That wee mouse is adorable! Brilliant star shaker. Cheers. eep! So cute, love that sweet mouse! Cute and colorful mouse and I like the snowflake shaker. Who doesn't love a shaker like this? These colors are great, as always perfect card!! Aww, this is a sweet shaker card! I adore the coloring and design. LOVE the snowflake window for your shaker! SO CUTE! Your creation is ever so clever! What a wonderful snowflake shaker!! Love the bright colors, too! OMG, I just love this beauty! I love shakers, I love the sweet image, love the cute design. Oh, I love that shaker! 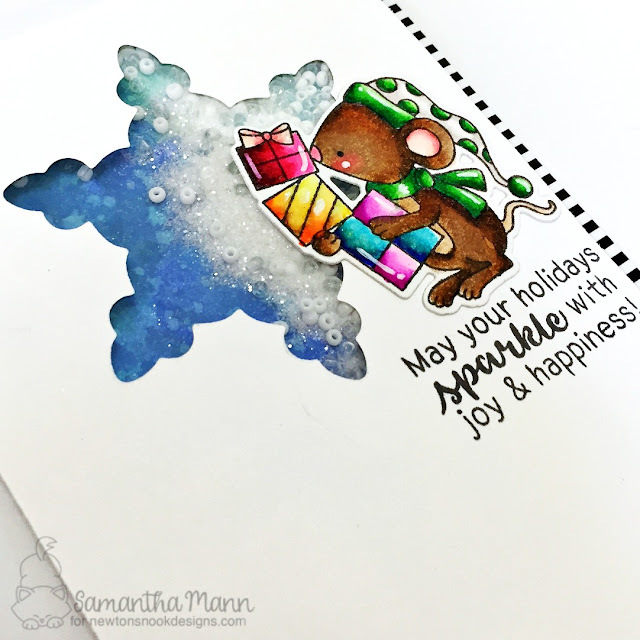 What a great idea to make the snowflake frame that adorable little mouse! Thank you so much for sharing a wonderful idea! Adorable shaker. Thanks for the inspiration. Great snowflake shaker & that mouse... so so cute! tangled up in a Christmas rush!